Get the backstory on the buildings you pass and visit often. Discover the background on Stratford Square, and more Del Mar landmarks, during a new, tech-helpful historic Del Mar walking tour. WHAT DID THAT BUILDING USED TO BE? It's a common question asked by lovers of cities and towns and those who need to know our common civic backstories. But it isn't a question that's always easily answered. Perhaps the current shopkeeper inside the building can piece together a few facts, or the chamber of commerce, but learning the history of a structure as you stand before it is kind of a rare treat. That's less rare, though, at least around Del Mar, which has recently introduced a number of plaques on some of its more prominent, well-known, and well-storied landmarks. True, many a city hangs austere and fact-filled facts, but the Del Mar plaques have a fresh twist: There's a scannable QR code that will summon the information about the structure to your phone. Meaning its a history-packed walking tour, but one without a guide. Or, rather, your smart phone is your guide. SO SATE YOUR CIVIC-COOL CURIOSITY... about the Del Mar Library, "which was formerly the St. James Catholic Church, which celebrated its first mass in 1914 without pews, lights, or an altar." 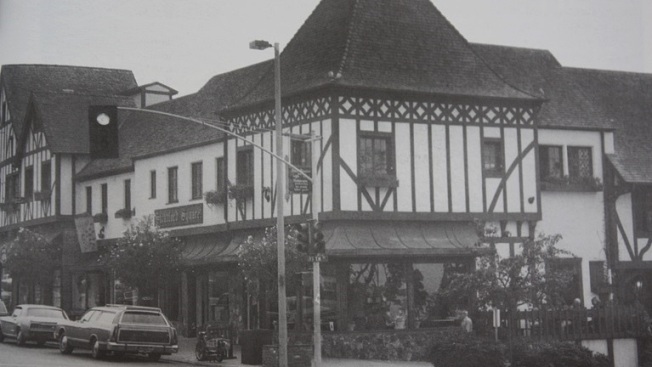 And L'Auberge del Mar once housed Hotel del Mar and the Stratford Inn. (Year built: 1910.) Every street, every thoroughfare, and every burg has a tale or two, and being able to access those tales any time, via technology, is a very nice, oh-so-convenient thing, indeed. WANT TO DO A LITTLE READING... about the Davidson Building and Del Mar Plaza now? You can, here. Honest, how many times a year -- or a month or a week -- do we zip by these places without knowing what they have to tell? Cities, like the people who occupy them, brim with dates, anecdotes, and vivacity, too.